In a farmhouse design, the side table seems to have important roles that are unreplaceable. The farmhouse side table is not there for merely functions but the right design and placement could increase the overall look very well. In a concept that is cohesive with the nature and earthy elements, this furniture could still bring harmonious concept with unlimited design features. You can find out many types of side table for farmhouse home concept that are designed distinctly. The design still follows the farmhouse rules which are minimalist, affordable, and natural. If you are working on a renovation and planning the farmhouse concept as the future design, you don’t really need about extra budget for the small furniture like the farmhouse side table. It is really makeable and, for experienced DIYers, it won’t need the whole day to finish one. There are many inspirations you can discover in our gallery. They are creatively made using reclaimed materials that can be acquired with only few bucks. Minimalist finishing also makes this farmhouse furniture really easy to create by yourself. 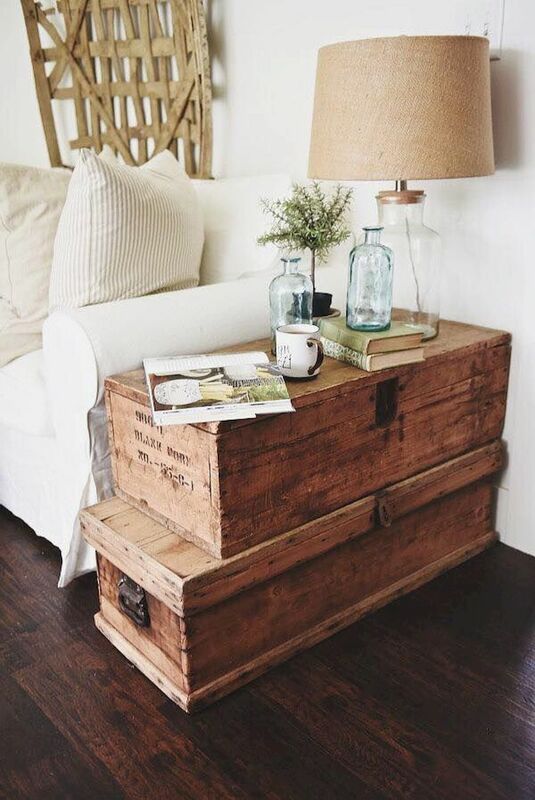 The ex-pallets, cable rolls, wood carts and old wooden box are best materials for DIY farmhouse side table. They are easy to find and you can purchase them with lower price than buying the top-quality woods. For such materials, the phase that need more time is only during cleaning process. Since they are considered as garbage, the whole cleaning is needed to make sure that they are safe to be put inside your house. There is no need to prepare extra tool for making the side table from the scrap. For the simple one, you may only need the basic tools such as hammer, hand saw, tape measure, and some nails. There is usually no intricate joint that need more cautions and tools.